The lists below show the local FM stations that I can receive year-round in my Northern Virginia home during normal conditions without DX enhancement. Click on the video to the right to watch my FM dial scan video from 2/2/2019, showing a true representation of normal radio conditions without any tropospheric enhancement at my home. Please note that since the radio dial is always changing, this video may not represent the current radio dial listed below. Stations are listed as follows: Frequency, calls, city of license, distance, station name, format, RDS/HD, signal strength. Click on a station’s calls to view their website. First signed on in 2007 as an LPTV broadcasting the Unison TV network with the calls W06CJ, the signal took on the calls WDCN-LP became an all-FM station in 2010 with a Spanish format. WAMU, operated by American University, is Washington’s longtime National Public Radio affiliate. Many NPR shows are based at WAMU’s studios in Northwest Washington. WEAA serves Baltimore with Jazz and, on occasion, urban music programming. In the summer months, WEAA often mixes in with Richmond’s 89.9 WCVE at 77 miles away. An eclectic mix of music can be heard on 89.3 WPFW, including everything from urban, reggae, and world music. They also, on occasion, air progressive talk programming. After years of being the only major DC FM signal that didn’t run RDS, WPFW finally added the service in 2017. This translator signed on in 2008. For years, it relayed Roanoke, VA’s 88.3 WRVL as “Victory FM” with religious talk; later with contemporary Christian as “The Journey,” but it was sold and became a relay of 89.9 WPIR in 2016. WPIR is the flagship of the “Your PER” contemporary Christian radio network that can be heard almost everywhere in the northern region of Virginia via a chorus of translators and its full-power simulcast, 90.5 WPER. The signal has retained its format over the years, but has gone by several names, such as “Positive Hits PER” and “Virginia’s Positive Hits, 89.9 & 90.5 PER.” WPIR, although only 29 miles away, often gets clobbered by HD Radio interference from local 90.1 WCSP at my home and is a difficult, if not impossible, catch indoors. WPIR does often come in when I’m in my car. Up until February 2018, this signal had the WPER calls, which went to its sister outlet on 90.5 as part of a multi-station callsign swap. Perhaps one of the only, if not the only, 24/7 politics-formatted FM signal in the US, WCSP has aired C-SPAN Radio as long as I can remember. It features, much like C-SPAN-TV, gavel-to-gavel coverage of congressional happenings, as well as audio relays of important political proceedings, such as the State of the Union or political conventions. Its HD Radio multicasts offers even more political coverage that differs from its main HD-1 signal. WPER is 89.9 WPIR’s full-time simulcast signal. The station was known as WJYJ “90.5 Joy FM” and aired a similar contemporary Christian format before it started relaying WPIR in the mid 2000s. In February 2018, WJYJ swapped calls with co-owned 88.1 WPIR in Hickory, NC. Later in the same month, 90.5 FM swapped callsigns once again, this time with simulcast 89.9 WPER. WETA-FM is the FM complement of WETA-TV, Washington’s major PBS affiliate. WETA-FM airs a classical music format, but it was all-news in the early 2000s. After cross-town 103.5 WGMS’ classical format flipped to 104.1 WWZZ and after the new 104.1 WGMS flipped to adult hits a year later, WETA reportedly acquired WGMS’ musical library and switched formats accordingly. This wasn’t the first time the signal was classical–it had a long history of the format prior to being all-news. A new signal as of 2016, WARN moved from 91.5 to 91.3 FM as part of a two-station signal allocation swap in Northwestern Virginia. Nearby 91.3 WTRM Winchester, VA moved to 91.1 FM in 2015, allowing WARN to assume the 91.3 frequency. WBJC is Baltimore’s classical station. Its blowtorch HD Radio signal decodes at my home at almost all hours of the day, even when the other Baltimore FMs are weak. WGTS is Washington’s longtime contemporary Christian radio station. WGTS utilized HD Radio technology for a short time–it debuted in 2015, but was turned off in early 2018. A rare signal that is stronger at home than in my car, WERQ is Baltimore’s urban radio station. Owned by Radio One, WERQ’s format focuses on more upbeat urban music and less R&B. A longtime hot AC station, “Wink FM” comes in local-grade at my home, given its transmitter is high atop a mountain in the Appalachians to the west. Much like 93.3 WFLS, WINC’s signal covers a lot of land in the upper portion of Virginia, as well as eastern West Virginia, and most of Maryland. This station has long simulcated another frequency in the DC area. WDCJ’s pairing with 94.3 in nearby Buckland, VA started in 2001 when then-92.7 WMJS “Easy 92.7” ended its easy listening format. It went off-air for a short time and returned with a Spanish format, as WBZS “La Mega 92.7, 94.3.” The simulcast continued in 2006 after a format flip to sports as WWXT when both signals began relaying nearby 980 WTEM, DC’s ESPN Radio affiliate. Due to the new “trimulcast,” the station was penned “Triple X ESPN Radio.” The sports format lasted for nearly a decade, ending on May 1, 2017. At that time, WWXT also ended its pairing with 94.3 and started to rebroadcast DC’s 102.3 WMMJ. The station changed its calls to WDCJ and added HD Radio and RDS soon afterward. WDCJ is local grade at my home, but often gets succumbed by strong DX. This signal is a new sign-on as of late 2016, rebroadcasting 730 WTNT Alexandria, VA’s spanish format. Before 2016, 92.9 was the clearest FM frequency in the Washington region, with no major signal for at least 90-120 miles in all directions. When W227BM signed on, I was living at another location in Woodbridge, VA and its signal was local-grade, ruining DX on 92.9. It was a pleasant surprise upon moving a few miles away in 2017 to find 92.9 open and “DXable” once again. Baltimore’s Country station is a semi-local at my home, always bringing in a stereo signal. Its HD Radio signal only pumps in during summer signal enhancement, but it usually comes in with RDS all day. A country station for as long as I can remember, WFLS is a mammoth of a signal that can be heard throughout most of Virginia. Once known as “93 WFLS,” the station added the “.3” to their name in 2007. The station turned off its HD Radio signal in 2017. One of DC’s two major urban FM signals, WKYS tends to lean more urban and less rhythmic CHR in comparison to its chief competitor, 95.5 WPGC. It was known for years as “93-9 Kiss FM,” before simplifying its name to “93.9 WKYS” in 2002. The station’s name often swapped between the two until the late 2000s, when the newer name stuck. In the mid 2010s the name transitioned to “9-3-9 WKYS,” but it returned to the tried-and-true “93.9 WKYS” in 2017. WZLV flipped to K-Love on July 20, 2017, being the first major (non-translator) K-Love signal in the Washington, DC region. From 2006 to early 2017, the station, under the WWXX calls, was paired with nearby 92.7 WWXT as FM simulcasts of DC’s 980 WTEM sports radio. From 2000-2006 it was also simulcasted with WWXT as WBPS “La Mega 92.7 & 94.3,” airing Spanish music. Before that, it operated as its own station (non-simulcasting) as WUPP “Up Country 94.3” before 1999 and hot AC WPLC “Pulse 94 Dot 3” for less than a year in 1999. A longtime religious formatted station, WRBS is Baltimore’s main contemporary Christian station. Prior to 2009, the station was religious talk “95.1 WRBS.” Like 91.9 WGTS, WRBS is a latecomer to the HD Radio scene, turning on its IBOC signal in 2016. WPGC is the second of DC’s two urban FM signals. While its core format is urban, WPGC’s format is always in flux. For a while it will sound like a mainstream urban station, then at other times it’ll throw in a few rhythmic CHR or CHR songs into the mix. WPGC was once the home of the popular morning DJ Donnie Simpson, whom now resides on cross-town 102.3 WMMJ. Although the station has been known as “WPGC 95.5” for as long as I can remember, it was briefly named “95-5 PGC” and “95-5 WPGC” from 2009 to 2010. The station resumed using its “WPGC 95.5” name afterward and to this day. Often a top contender in the Washington, DC radio ratings, Howard University’s WHUR airs an urban adult contemporary format and has done so for the entirety of my DXing career. Its direct competitor is 102.3 WMMJ, however, WHUR tends to play softer R&B songs, save for weekend programming which can focus on anything from reggae to talk programming. WHUR’s HD Radio signal is often off-air for days at a time, which is great from a DXing perspective, as it allows 96.1 and 96.5 FM to be open for DX. “Wash FM” is DC’s prominent adult contemporary radio station, heard in many doctor’s offices, businesses and retail outlets in the area. Home to many popular radio shows like “Delilah” and Christmas tunes during the holidays, WASH often tops the DC radio ratings. This translator signed on in 2013, originally airing conservative talk as an FM relay of WTNT 730. It went dark for two years, returning with a stunting loop of country music in mid-2015. In late 2015, the signal rebranded as “Mega 97.5” with a Spanish format, relaying the HD2 subchannel of 102.3 WMMJ. A blowtorch FM signal that blankets Northern Virginia, WIYY airs an active rock format that dates back decades. A sister station to 97.7 WMDM, WSMD has been named “Star” for decades. This station was often on in the car when I would accompany my mother on errands as a kid in the early 90s, as classic hits “98-3 Star FM.” By 2006, it was hot AC “Star 98.3.” Today, WSMD airs a satellite CHR radio network. WMZQ is Washington’s only country music station. Although its name has largely been simply “98.7 WMZQ,” I have heard it go by “98.7 WMZQ Country” off and on over the years. This is one of the few signals in the DC-Baltimore area that puts a local-grade signal into both cities. Originally heritage modern rock WHFS when I started DXing in 1999, the station was sold in 2005 and reportedly kept its format flip to Spanish (and related firings of its existing air staff) a secret until it happened, according to DCRTV.com. WZLL “El Zol 99.1” soon changed its calls to WLZL. In 2012, the Spanish format, as well as the WLZL calls, moved to cross-town 107.9 while 99.1 segued to all-news WNEW “All News 99-1.” Soon afterward, its previous city of license of Annapolis, MD changed to Bowie, MD. In 2015, WNEW renamed to “News Radio 99.1” and a just a year later, flipped to business news as WDCH. The station used to run RDS but turned it off in 2017, rendering it the only major Washington, DC-area full power signal to not run RDS or HD Radio. “Hot 99-5” is currently DC’s only CHR station. It flipped to CHR in 2001 in an attempt to unseat then-dominant CHR 104.1 WWZZ. WIHT often ran liners criticizing WWZZ and its weak signal from Southern Maryland, which wasn’t strong within DC and its northern suburbs. Several months later, WWZZ flipped formats, allowing WIHT to prosper as the city’s sole CHR. WIHT remained the only choice in DC for pop music until 2013, when 107.3 WRQX flipped to CHR. That lasted for three years, until WRQX flipped back to its previous hot AC format. From 1999-2001, frequency was known as jammin oldies WJMO “Jamn 99-5” and before that, longtime easy listening/beautiful music WGAY “99.5 WGAY.” Personally, I have fond memories of the old WGAY, as it was what my grandmother always played in her car in the early-to-mid 90s when I’d visit her as a child. A blowtorch signal that comes out of nearby Frederick County, MD, WFRE goes by dual names, either “Free Country 99-9” or “99.9 WFRE,” depending on the preference of the DJ or voiceguy at the time of reception. “Big 100.3” is a station that has seen many similar, but distinct formats over the years. In the 1990s it was “Oldies 100,” airing 50s-60s oldies. In the 2000s, the station adopted the “Big 100” name and aired classic hits, later classic rock. A modern rock station for as long as I can remember, “DC101” was one station that everyone listened to when I was in high school in the early 2000s, as well as WPGC/WKYS/WHFS/WIHT. For the longest time, the station seemed to be heavy with recurrents from the grunge era of the early 90s (i.e. Nirvana), almost acting as an active rock station at times due to the lack of new content. However, in recent years, the station seems to become much more “modern” and has dropped a lot of the older songs. WBQB, like cross-town 93.3 WFLS, is a blowtorch signal that can be heard almost anywhere in the northern half of Virginia. Although it has retained its hot AC format for years, it has been borderline CHR at times, which was extremely apparent when it briefly took on the three-note “Kiss FM” signature musical tone in its imaging in the late 2000s. Originally heard when I started DXing as “Lite 102,” this longtime AC station was known as “101-9 Lite FM” for years before changing to its current name in 2014. Its signal is very strong at my home, often decoding full HD Radio. Always in competition with cross-town WHUR, WMMJ is plagued with a weak signal compared to other major DC FMs. On May 1, 2017, the station started its simulcast on nearby 92.7 FM, widening its coverage area in DC’s south and southeast suburbs. Although urban adult contemporary at heart, WMMJ often throws in other related styles of music in its playlist, such as urban, old school urban, and Go Go. One of the cookie cutter “Jack FM” signals heard in many cities nationwide, WQSR was once WXYV “B102.7” with a CHR format. It flipped to oldies in 2002 as WQSR, inheriting the format from Baltimore’s 105.7 FM when it flipped to urban as WXYV. WKIK has been country for as long as I can remember. Its sung “Country 102.9 WKIK” jingles are often done by the same people who makes jingles for 99.9 WFRE, so it is amusing to hear the same thing on two stations (with the obvious differences) while DXing. One of the last locally owned and operated FM signals in the DC-Baltimore area airing lots of indie rock, WRNR is a surprise semi-local signal, given its distance and weak ERP. Its signal often blasts in most of the warmer days with full RDS. Once the home of Washington’s heritage classical “103.5 WGMS,” this station in 2006 became WTOP News’ flagship signal, which was formerly on 107.7 FM (107.7 still serves as a WTOP relay.) WGMS moved to DC’s 104.1 FM briefly and reportedly gave its library of classical music to DC’s 90.9 WETA after the 104.1 outlet changed formats a year later. Today, WTOP is often the #1 station in the DC radio ratings and has two suburban FM relays: 107.7 WWWT in Manassas, VA, and 103.9 WTLP in Braddock Heights, MD. Click here to read my article on the old WWZZ “Z104,” which occupied this frequency from 1996-2001. I remember tuning in this signal in the early 90s when it was classic hits WXTR “Xtra 104.” In 1996 it flipped to CHR as “Z104” with the WWZZ calls, simulcasted on 103.9 WWVZ Braddock Heights, MD. This was monumental because at the time, DC was without a CHR station since 1992 when 105.1 WAVA flipped to religious. I have many fond memories of listening to “Z104” as a child and teenager. The station flipped to modern AC in 2001 after a short battle for CHR dominance with 99.5 WIHT. While modern AC, WWZZ was also known as simply “104” and “Washington’s 104” before rekindling the “Z104” name, albeit without the CHR format, in 2004. This signal was briefly home to WGMS’ classical format in 2005 before DC’s 90.9 WETA reportedly took over the station’s musical library and, itself, flipped to classical. In 2007, while the 104.1 signal was being sold to Radio One, it was known as adult hits WXGG “George 104.” After going dark for about a week, the station returned as gospel-formatted “Praise 104.1” WPRS. 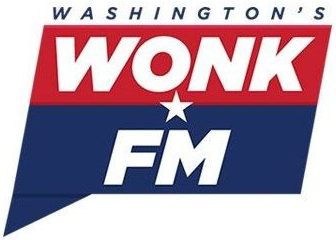 “Wonk FM” debuted in January 2019 with a news/talk format. The translator first came on-air in January 2017 as relay of co-owned 99.5 WIHT, “Hot 99-5,” intriguingly airing the signal’s CHR format a few seconds ahead of the main 99.5 signal, reportedly without the station’s “dump delay.” Soon after, the signal flipped to relaying 101.1 WWDC’s HD2 channel, a rock format without a name. By 2018, it adopted the name “104-7 The Rock Nation.” In April 2017, the rock format took a pause for a month and featured 80s music as “DC’s 104-7 Cherry Blossom Radio,” to coincide with the city’s annual cherry blossom festival. Once home to one of DC’s heritage CHR signals in the 1980s, WAVA flipped to religious talk in 1992, oddly keeping its CHR-era logo to this day. WAVA debuted its HD Radio signal in June 2018. W288BS airs the Russian Government’s news channel. From its debut in 2008 to 2017, the station was known as “WAMU’s Bluegrass Country,” which rebroadcasted 88.5 WAMU-HD2. Once home to the smooth jazz format as WJZW “Smooth Jazz 105.9,” WMAL now airs conservative news and talk, simulcasting longtime format bearer 630 WMAL. Between its smooth jazz and talk years, it aired oldies as WJZW “True Oldies 105.9” and classic rock as WVRX “105-9 The Edge.” WMAL used to broadcast HD Radio, but it stopped in 2016. A recent sign-on in 2016 stationed at Pope John Paul the Great Catholic High School in Dumfries, VA, WJPN-LP relays EWTN Radio. I have many childhood memories of this station, as my mother listened to it when I was a child. In the 1990s, WJFK was hot talk, airing the Howard Stern, G. Gordon Liddy, and the Don & Mike shows, along with smooth jazz music at all other times as “106.7 WJFK.” Once Stern went off terrestrial FM radio, the station retained its format but changed its name to “106.7 Free FM,” a move in line with similarly-formatted stations in New York, Los Angeles, Baltimore, and elsewhere. The station reverted back to its “106.7 WJFK” name in 2007, two years before it flipped to all-sports. In the 1980s, this was CHR WBMW, which often went head-to-head with similarly-formatted 105.1 WAVA and 107.3 WRQX. WJFK runs HD Radio, but its digital signal is off-air a lot. In the 1980s, WRQX was CHR-formatted “Q107.” In the 1990s the station flipped to hot AC as “Mix 107.3,” but retained the WRQX calls. In 2013, the station dropped the hot AC format, reportedly due to ratings, and resurfaced as CHR “All The Hits 107-3,” which changed names to simply “107-3” and also “DC’s 107-3” during a span of three years before reverting back to its previous hot AC format as “Mix 107-3” in 2016. From when I started DXing in 1999 to 2005, this was WTOP News’ flagship station sporting the WTOP calls. When the WTOP calls and format moved to 103.5 FM, 107.7 became WTWP “Washington Post Radio” and aired a long-form, news-focused talk radio format akin to the Post’s print format. The newspaper partnership only lasted a year, but the station retained the format until 2009, as WWWT “3WT.” In 2009, the station resumed its relay of WTOP. WWWT is now one of two suburban DC FM relays of WTOP. Once longtime religious-formatted WFSI, 107.9 became home of the “El Zol” Spanish format after it was taken off of the nearby 99.1 frequency in 2011. Its calls under the new format were WBGR for about a month before it changed to WLZL. Like 91.9 WGTS and 95.1 WRBS, WLZL was late to the HD Radio game, adding its IBOC signal in 2015. Unlike most Spanish stations I’ve heard, WLZL is often bilingual, airing advertisements in English, English CHR songs mixed in with the tropical songs they usually air, and its DJs often switch between both languages many times during a normal break.